← Do manufacturers listen to their home theatre receivers? Well, there I was, once again incorrectly, thinking that the whole matter of passive 3D was settled. 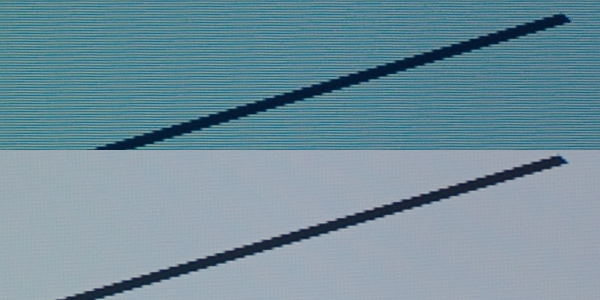 A couple of weeks ago I established, I think, that the current top of the line LG TV, the 55LM9600, uses two different strategies in 3D mode for allocating source lines to display lines. Some form of line allocation is necessary because only half the number of display lines are available for each eye view as are provided in the source video. 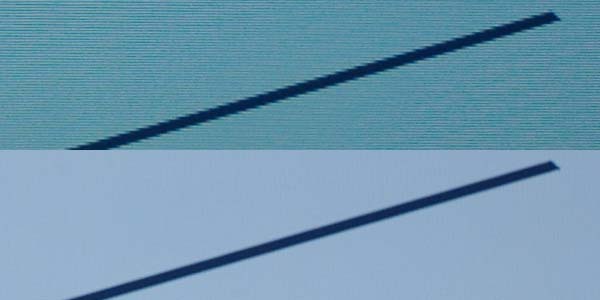 My tests suggested that generally the 55LM9600 used ‘Both Line Allocation‘, but it was clever enough to notice that some content was in the same plane for both eyes, and in such cases it would use ‘Alternate Line Allocation’. See what I see? Jaggies on the both-eyes-view version at the bottom. This TV clearly used both line allocation for this one (as it did for the alternately coloured line tests, which I checked). However with the menu from Cats & Dogs: The Revenge of Kitty Galore, this TV delivered full resolution from the flat sections of the picture, even though they were in 3D mode. So it that mode at least, it still seems to have different processing depending on the picture content. This entry was posted in 3D, Testing. Bookmark the permalink.